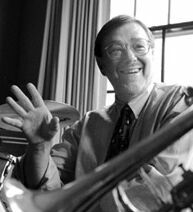 Since his appointment to the Harvard Faculty in 1971, Thomas G. Everett has founded and directed the Harvard University Wind Ensemble, the Harvard Jazz Bands, and the Harvard Summer Community Pops Band. He also prepares all ceremonial music for the University. A graduate of Ithaca College Conservatory of Music, he has held teaching positions at Brown University, the New England Conservatory, the International Trombone Workshop, the Indiana University Summer School and has given seminars at the Harvard Graduate School of Education. As a noted bass trombonist, he has performed for the Bolshoi Ballet, Boston Ballet and Opera Orchestra, the Boston Pops Orchestra, the Portland (Maine) Symphony, and the jazz bands of Tommy Dorsey, Dizzy Gillespie, Ray Charles, Phil Wilson, and the International Trombone Association. He has premiered in recital over thirty new works for bass trombone and has performed at New York's Carnegie Recital Hall and the Second World Association of Symphonic Bands Conference in Skein, Norway. Mr. Everett has been a conductor, adjudicator, and soloist throughout the United States, Europe, and the Former Soviet Union. He conducted a program of American music live on Hungarian radio and received the Artijus Award from the Hungarian Government for his performance of Hungarian music. He is Founder and first president of the International Trombone Association and past president of the New England College Band Association. He has published articles in The Music Educators National Journal, Perspectives in Black Music, Cadence, Brass Bulletin, The Instrumentalist, The Journal of Jazz Studies, The College Band Directors‚ National Association Journal, and was trombone editor of Brass World. Media Press publishes his band work "Feowertig."